Behind Rosewood's grand facades, where the air smells like apples and Chanel No. 5 and infinity pools sparkle in landscaped backyards, nothing is as it seems. It was here, back in seventh grade, that five best friends shared everything--Seven jeans, MAC makeup, and their deepest, darkest secrets. For Aria, Spencer, Hanna, and Emily, it was a dream come true . . . until Alison, the most beautiful of them all, suddenly vanished. Now someone named A has turned their charmed lives into a living nightmare. Emily has been shipped off to her hyper-conservative cousins in Iowa. Aria is stuck living with her dad and his home-wrecker girlfriend. And Spencer fears she had something to do with Alison's murder. But Hanna's fate is far worse than all of that--she's clinging to life in the hospital, because "she knew too much." With A's threats turning dangerous and Ali's killer still on the loose, the girls must uncover the truth--about A, about Ali, and about what happened to Hanna--before they become A's next victims. But as they unravel Rosewood's mysteries and secrets, will it bring an end to the horror . . . or is this just the beginning? Thanks once again to Rachel @ Rachel’s Reading Corner! Emily, Spencer, Hanna and Aria are still harassed by A’s text messages. Hanna begins to recover from her car accident. Jenna reveals that it was actually her and Ali that planned to get rid of Toby. Mona befriends Spencer and admits that she gets A messages too. Melissa begins to get framed for Ali’s murder. Hanna recovers from her amnesia and realises it A is Mona. 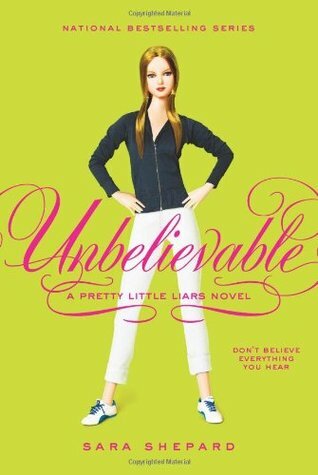 Spencer is kidnapped – kind of – by Mona and driven to a remote location. A struggle ensues and Mona falls of the side of a cliff – but not before revealing that she really is A, knows the girls secrets because she found Ali’s old diary and was actually there the night of the Jenna Thing. She also knows who killed Ali: Ian, who is arrested at the end of the book. He pleads not guilty at a summary hearing. Emily returns home after seeing her parents on TV saying that they love her. Mona and Hanna make up. Mona and Spencer plan a party for her. Spencer finds herself, surprisingly, enjoying Mona’s company. Mona confesses to her that A has been sending messages to her too. Hanna is happy that Mona likes Spencer. They consider letting her join their little clique. A tells Aria that Meredith has a secret job at Hooters. She goes there with Mike to see but A was lying. Darren Wilden and a few cops are there. Aria nearly tells them about A. Mike realises something is up with A, he urges her to talk to Darren. She spills it all to him. At Hanna’s party, Aria tells Jenna what happened the night she was blinded and apologises. Jenna reveals that is was actually her and Ali that organised to get rid of Toby. Ali decided to help because she had “sibling problems” too. Jenna hints that she knows who A is but is scared to talk and leaves quickly. Emily and Maya are reunited. Trista Taylor – a girl Emily met and flirted with in Iowa – comes to visit and she shatters Emily and Maya’s relationship. Emily isn’t sure who she really likes. Maya catches Emily and Trista dancing together and storms away. Emily is saddened when she later sees Trista and Noel hooking up. Melissa confronts Spencer about seeing Ian behind her back. Spencer denies it. Spencer and Mona discover a note from A. They suspect Melissa may have murdered Ali because she was jealous of Ali’s secret relationship with Ian. They inform the other girls, and decide to turn Melissa in. Mona drives Spencer to the police station. Aria tells Emily and Hanna the truth about the Jenna Thing. Hanna’s memory returns (she is suffering from amnesia after the car accident). She suddenly remembers that she knows who A is: Mona. Spencer is hesitant in turning Melissa in. Mona convinces her it is the right decisoon. Spencer gets a text from Emily saying that A is Mona. She gets more texts from the girls worrying what Mona will do and Mona realises that they’ve figured it out. Aria, Emily and Hanna go the police station to tell Darren that Mona is A. Meanwhile Mona drives Spencer to Floating Man’s Quarry where she explains that she was actually there the night of the Jenna Thing. And when she moved into Ali’s house – after she went missing – she discovered Ali’s old journal filled with the girls’ secrets. She used the information to become A, and blackmail the girls. She wanted to get revenge for Jenna – since the girls were responsible for blinding her and they were friends – and for herself – the girls used to bully her and she was mildly burnt by the firework during the Jenna Thing. Spencer accuses Mona of murdering Ali. Mona says it was actually Ian who killed her – Ali was blackmailing him at the time about their secret affair. Spencer secretly calls Darren who overhears the conversation with Mona and learns their location. Mona tells Spencer she planned to frame her (Spencer) for Ali’s murder but recently started to like her so she decided to frame Melissa instead, as a favour to Spencer (Melissa is pretty terrible to Spencer). She offers Spencer the chances to live (Mona plans on killing Spencer) if she becomes A with her, saying that they can frame someone else if she wants. Spencer refuses. Mona attacks her and they fight near a cliff’s edge. In the struggle Spencer pushes Mona and she falls over the edge to her death. Aria, Emily and Hanna arrive with Darren and the police. They find Mona’s body and Spencer unconscious. Hanna is completely shaken that this whole time her best friend has been this horrible enemy, and is now dead. Spencer wakes up. She tells Darren that Ian killed Ali. Hanna finds Mona’s Blackberry that she used to send A’s text messages. The truth about A is made public a little while later. The girl’s relationships are restored with their families – mostly. Hana still has Mona’s Blackberry and decides to delete all her messages (that Mona sent to Hanna) to protect her secrets from getting out. Ian is arrested. The girls go to his court hearing. He pleads not guilty. As they leave, Emily catches a glimpse of someone who resembles Ali. She’s a bit spooked, but the girls are relieved that they can now move on. The Jenna Thing = an accident that occurred while the girls were in the 6th grade. See this PPL wiki page for all the details.